Is anybody familiar enough with the city to point me in the right direction? Note: For this trip I'm packing light and only bringing an x100. I've traveled with a DSLR and a plethora of lenses in the past and it just gets in the way for street shooting. I think 35mm, f/2.0, good ISO performance, and a leaf shutter will be plenty. Edit: Just a little update. I did go to HK and had a great, short stay. (Here are a couple of photos I took: 1, 2.) Anyway, I just stumbled across this quick guide to HK photography and I thought it would be a good addition: https://www.youtube.com/watch?v=fi1_Ti0GWu4. I LOVE taking photos in Hong Kong. I have taken many photos in mainland China and in Hong Kong and a few other Asian countries - HK has a special "flavour" of its own. The answers to your 3 questions are "many places" in each case :-) - but there are some specialist ones. You will find mixes of all sorts of things all over. The really and genuinely old is largely gone from HK. High rise accommodation is the order of the day. You can get some genuine rural stuff in the New territories - a cheap fast not too long (30 minutes max?) train ride North. But largely in HK once you get away from the glitzy Western Nathan Road thieves parade you find ordinary people living "authentic" lives with much of traditional China and Western fare interspersed. Much worthwhile to see by "just wandering". Hong Kong is closer to London in style than it is to typical mainland Chinese cities. Accepting that and then finding how the mixture works is the fun. Uncovery's list is good. I'll try to add to and expand only parts of it. Evening most nights. Take subway (MRT) to exit D1? - see area B on map. Exit onto Argyle Street. You arrive in the middle of a party. Hot, loud music. Many many people. Intense. 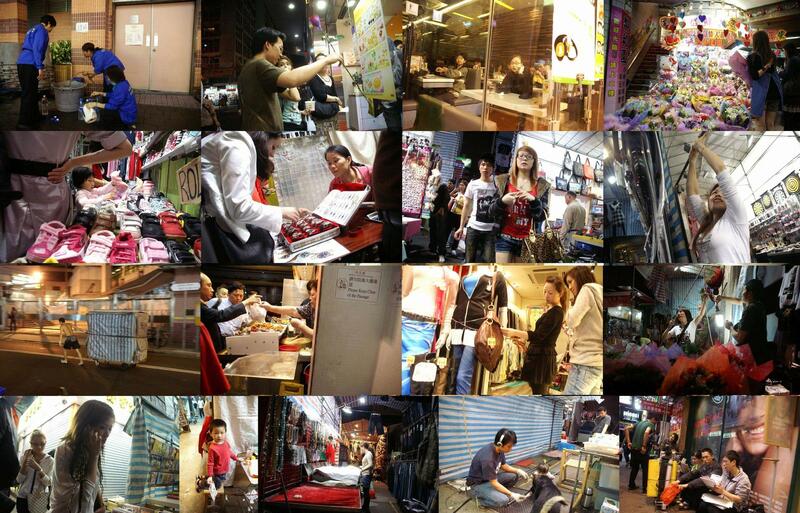 Argyle street is mainly western style shopping with a strong Chinese flavour and many HK residents. Yes, there are many tourists, but also much is as authentically Chinese as in many mainland Chinese street markets (and I've seen many). Sets up in evening early. Runs till 10 pm in full swing then shuts down over next hour or two until; by midnight all you'll find will be a few solitary folk pushing large carts full of packed up stalls, and me with my camera :-). LM (Lady's Market) largely sells clothes and baubles, handbags, belts, knick knacks and more. It IS a tourist trap BUT it's also a locals trap and packed with every version of HK denizen you can hope for. (Very few pick pockets here). Wall to wall packed people, noise, bustle, commerce. Double row of stalls front a narrow lane with shops on outside with narrow space between shops and stalls. Chaos. Variety. Colour. People. Fun. I tend to use an APSC camera with 18mm lens, f/biggest-apertue-possible. An eg 50mm f/1.8 is just too hard to use well. I actually use an 18-250 which allows you to reach out to something far away and then back for a closeup. At 18mm a reasonably frame filled person photo is "very close" and starts to distort. Back just a little and it works well. (On an APSC with OK AF you can leave the lens at 18mm and use it as an unsighted point and shoot. You get used to how close you can be and need to be for an adequate shot. Should you wish to you can walk though a crowd and take closeup shots of people as you walk (or jostle) past each other. One street across from LM towards Nathan Rd (Sal Young Choi?) is a high tech shops street with cameras. electronics etc. Also full to the brim with people. Much wider street . No stalls. Many human interest scenes. Street performers and street performing advertisers abound. Excellent for a wide range of people and shots. Delve just off this area and you find food shops not much different from those almost anywhere in China. You can stand slightly behind and to one side of a food stall and observe all sorts of food/people/light/seller/buyer scenes. Excellent. Permission: How you go about street photography is your choice. You are unlikely to get assaulted in HK if you do not ask, and unlikely to get the really candid shots if you always ask. I try to strike a balance - a few candid shots and if they look good I'll approach the subject and show them. In Lady's market the melee is usually so great that it's mostly shoot while you move with the flow. Map C - Goldfish market is interesting. 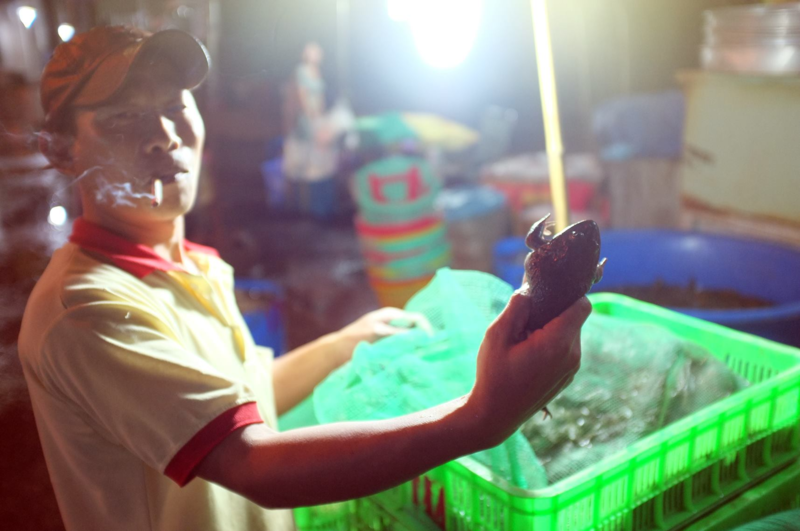 Many dozens of shops sell goldfish on all size and vasts quantity - often displayed swimming in plastic bags. 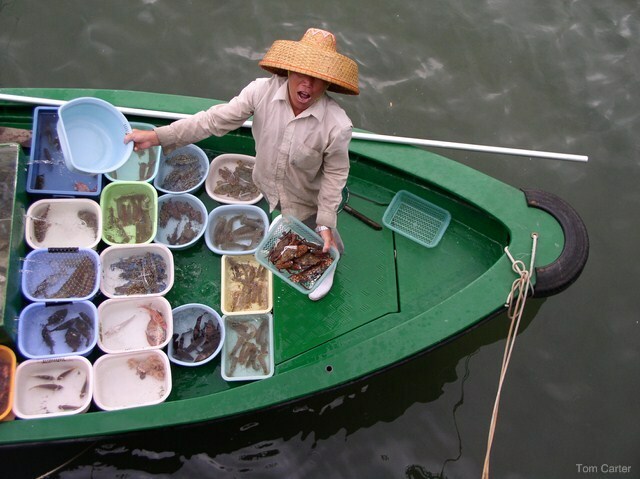 Apart from the fish themselves the people coming to buy and inspect are a treasure. (The Goldfish are sold because they are auspicious rather than just as pets). Map D - Bird Garden. Yes! The birds are great, but the owners are 'greater' :-). Old men bring their caged birds to display or compare or just for the companionship. Shops sell birds and cages and feed (by the bag: crickets, maggots, ... ). Sellers with eg 6 African Grey parrots force feed them some evil mushy gunk by inserting a long tipped HUGE syringe down their throats and filling the birds stomachs with the contents. The birds seem eager to participate. Offputting for the uninitiated but fascinating. Map E - by D (I see I have two E's). Flowers. Not quite so people valuable but interesting. E in green square. Some fairly rough and photo valuable locals-buy-here street food markets. Fish, vegetables, meat, ... Fish in shallow polystyrene trays of water with if they re lucky air bubblers to help keep them alive. Piles of crabs tied in ?rattan" to keep them immobile regard you balefully and flex their eye stalks at you. Sad. Cages of hens piled high awaiting their fate. Butchers shops that will make you swear off meat for a month, or a year or for life. And all about the "ordinary people". In the above food-markets area: Evening. Darkish. Very old lady (70++? 80+?) tries to balance too many boxes on a tricycle. I watch from across a small road and take photos, camera braced against a post to combat low light. Boxes fall. She scrambles for them. Nobody helps - the norm too often. I cross the road and help her gather and restack the boxes. She looks at me - BIG smile, very pleased. No English. No Chinese. Perfect communications. She reaches into a small bag and hands me perhaps 4 or 5 Lychees on a stem. My heart sings. Profuse thanks. Bows. Pleasure. A photo or two more. Stunning. Much more but work calls. Hongkong MTR aka Mass Transport Rapid aka subway is fast cheap clean convenient superb. And more. Use it !!!. 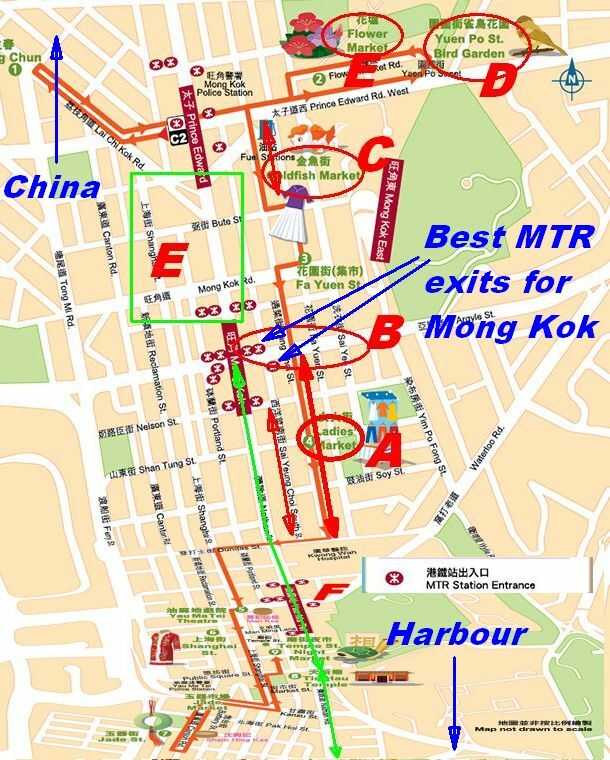 Brief: Long green line follows Nathan Road down to TST (Tsim Sha Tsui) area and MTR stop and harbour. TST to Mon Kok by MRT is ?5 minutes? + stops. You can walk Nathan Road on foot in perhaps 30 minutes - it always takes me 2x + as long as photos happen along the way. Fewer shops etc. Better after you have exhausted the denser stuff. Use the MTR! Go to TST. Walk down to harbours edge in EARLY morning. People will be quietly Tai Chi'ing in ones or groups. Some form of communal dance may happen. Walk to water near TST (crossing roads can be HARD - try not to. Walk East along waters edge. Go back at night at 7pm. At 8pm EVERY NIGHT there will be a must-not-be-missed at least on one occasion LASER light / searchlight/ dancing buildings + music show - ALL the cities major buildings will join their lights in computer controlled synchrony. And sound to match emanates from speakers all round the harbour. Light string lit tourist junks ply the bay. Dirty little "Hey You" tugboats drop off and rescue small groups of mysteriously scurrying workers. Star Ferrys ferry to and fro. Families promenade. Vendors vend. The city sights are fun BUT the whole is laced with people of every age and bent. Many photo opportunities. Commercial photographers take tourist photos with tripod mounted cameras. Go and admire their hardware. Wave your camera at them. Fun happens. Take the cable car to Victoria Peak. Take your longest telephoto. Try to pick a clear (relatively) haze free day. This is NOT really on your list but you will never be sorry. View of HK is amazing. If you have time and are obstinately gregarious you can catch the bus to the Victoria Peak top station and make friends with unwary locals on the way. This may not appeal to all :-). The cablecar ride is worth doing. Boats in boat harbour North of TST and people thereon may give you some of the realest glimpses of rural / old / authentic China. Cross the harbour on a Star Ferry at least once. People happen. Scenes are great. Serene. Nominal cost. Bonus: If you want to push your time available to the max: Many of the airlines operate an in-town-checkin located at the airport express (train) city terminal. Check your bag there and you can arrive panting at the airport desk just before closing time - you add 1 to 2 hours of city time and do not have to lug a heavy bag. KNOW HOW TO FIND THE AIRPORT EXPRESS TERMINAL when it comes times to leave. It can be hard to cross city blocks in certain directions. If you do not know the route to the in town terminal you may be about to stay another day. The Airport Express uses super high speed trains with 2 only brief intermediate stops These 'fly' you to the airport in about 30 minutes - probably peak at over 100 mph. Once you are on the train you know that you have or haven't made your flight :-). Airport terminus is about 1 minutes run from the terminal's main hall. Costly compared to bus or even taxi BUT the quickest and least hassle way to get to the airport. If you have specific questions on HK that go outside the scope of this site you are welcome to email me offlist. email address on profile page. If you have never been to mainland China and are happy to pay for a China visa you can get a train to Shenzhen border in under and hour (as I recall). Border crossing takes relatively little time if not super busy. To & from border & customs takes maybe 3 to 4 hours out of your total day. Plan on a 16 hour day and that's lots of time :-). [I can check photos and refine travel times if of interest to you]. There are two main border crossings and both have advantages. One drops you directly into the Shenzhen subway system. You have to get off and walk between. The very quickest way into China is to get a hotel taxivan which collects people from HK hotels or airport and drops you at hotel or whatever in Shenzhen. If you just take that into Shenzhen itself and then use the subway it is very very fast. This is also by far the least painful way I've met to get through China/HK customs. Sit in van, hold up passport, ... . (having filled in forms). Far dearer than train. About $US35 - $45 depending on company used. MANY offerers (I have contact details if od interest). If you started really early and came back late (don't miss border closure) you could get the better part of a day in "real China". Shenzhen subway is also very very very good. Frequent, cheap, fast, clean. no hassles. Inside the central city it is underground, but as you get out into the suburbs it is above ground with good views from an elevated track. As well as central Shenzhen (which is a much greener place than you would ever imagine) you can go North on several lines and you are soon in open areas with a mix of countryside, really old dilapidated areas and screeds of new construction. Hop off at most any station and 'just wander'. Wow. I can suggest some stations to get off at if you want to do this. Here are some places. 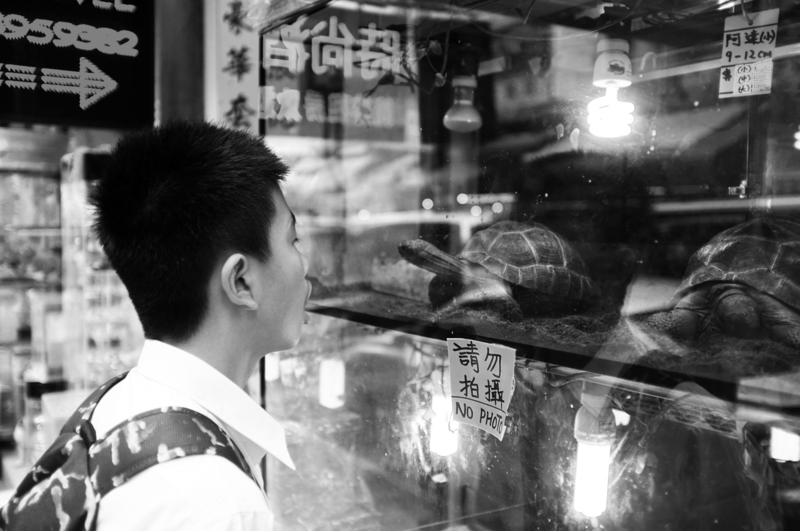 Hong Kong is sometimes tricky to shoot because things are in most cases too close up for the size they have. It's not easy shooting 40-floor high buildings when you are standing in front of them. I find my 15mm fish-eye very helpful at times. Causeway bay, specially around Sogo and Times Square for another busy area, more modern. Western Hollywood road, Man Mo Temple and the pedestrian street between Hollywood and Lok Lu Road. The smaller streets between Hollywood road and Wellington Street around Gage street have still some small manufacturing companies in open garages. You can see printing presses and others right on the street if you go during business hours. At night, many small restaurants opened there recently. Wan Chai at night for the red light district and the dark side alleys between the buildings (no worries, it's save, but bring a f/1.4 lens. Between Wan Chai And Causway bay there are several interesting small restaurants and shops, where a lot of things such as cooking happens on the street. The spaces under bridges at the Wan Chai MTR (Exit A5) and Causeway bay flyover near Russel Street / Canal Rd. You always have older HKG residents sitting there, some performing fortune telling and cursing for people. Most important in Hong Kong is leaving the main road, almost all of the side streets offer interesting views of old Hong Kong lifestyle. One more thing about dealing with Hong Kong people: Do not expect politeness, but neither aggression from people, be it as a restaurant customer or as a photographer. It rather follows the "tough love" principle. People are doing their job, you do yours. Smile at them in a possibly warm way, bow, excuse yourself, do something to brighten their day, and you will have a great day. For examples merchants in markets LOVE the attention of a photographer on how they arranged their food. Buying something does not hurt (prices for fresh food are amazingly low anyhow compared to Europe for example). Not the answer you're looking for? Browse other questions tagged photography hong-kong or ask your own question.